Friction stir processing (FSP) is emerging as a promising tool for microstructural modification. 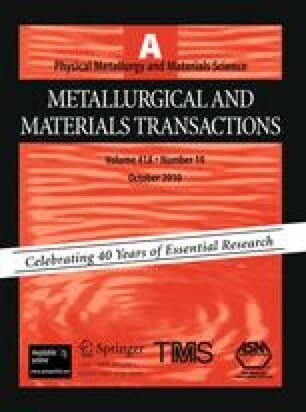 The current study assesses the effects of FSP on the microstructure and mechanical properties of an investment cast Al-7Si-Mg alloy. FSP eliminates porosity and significantly refines eutectic Si particles. The extent of particle refinement varied with changes in processing conditions. A high tool rotation rate and a low-to-intermediate tool traverse speed generated a higher volume fraction of finer particles. Tensile ductility changed significantly as a result of FSP, whereas ultimate tensile strength improved only marginally. Yield strength was similar in both cast and FSP samples under various heat-treated conditions, with the highest value obtained after a T6 heat treatment. Furthermore, FSP caused significant grain refinement in the stir zone, subsequently transforming into very coarse grains as abnormal grain growth occurred during solution treatment at high temperature. Manuscript submitted September 30, 2009. This work was performed under the NSF-IUCRC for Friction Stir Processing. Additional support is acknowledged from NSF-IIP (0531019), General Motors, and Friction Stir Link for the Missouri S&T site. This report was prepared as an account of work sponsored by an agency of the United States Government. The views and opinions of authors expressed herein do not necessarily state or reflect those of the United States Government or any agency thereof.